Venezuelan professional baseball player, who plays for the Houston Astros. He said once that he weighed 145 pounds and stood about 5 feet 5 inches at age 16. His proportions lead me to believe he is 5’4, plus he never looks near 5’5 in pictures, honestly a weak 5’4. If he measured 5-3 it wouldn't surprise me. He can certainly look that at the plate. This listing is way too high. Pedroia is not 5'9''- he's more like 5'6''-5'7''. If you see in this video: Click Here, you'll see that Pedroia helps out Mookie Betts (5'9'') at 0:21 and seems noticeably smaller in stature than him. Pedroia's a beast but its undoubtable that he's a tad short probs an inch or two above Altuve- his preference of a saggy, oversized Red Sox uniform doesn't help him and makes him look even smaller on the field. How tall is Pedroia? He definitely doesn't look 5'9". I don't think he's that much taller than Altuve. Holds up quite well with Canelo. Rob, how many inches does Canelo have on Jose? Editor Rob: depends how tall you have Canelo at, I think he could edge out Floyd, but isn't a 5ft 8 guy, so Jose can seem 5ft 5-5.5 zone. 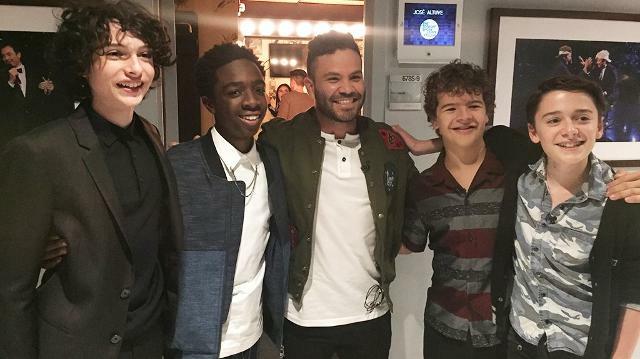 How tall is Gaten Matarazzo from stranger things then Rob? Where'/ Aaron Judge he is 6 foot 7. He had little over a foot on Altuve at games. Definitely in agreement here that he's likely a bit shorter than 5'5", especially given that this is what he was originally listed at meaning even that was a "sports height." Props to him for being a successful short baseball player. Altuve's a solid 5'4 most likely. But yes most baseball players under 6'0 tend to be overlisted. 5'9ers like Lincecum and Ichiro are routinely listed at 5'11. Pedroia's most likely shorter than 5'9, although Jimmy Rollins' 5'7 listing is probably accurate. He doesn't seem shorter than that to me. Alex Bregman is 5-8 going by LSU fans who met him in college. He as at least 4 inches on 5-4 Altuve. Rosenthal looks 5-3 at me. Editor Rob: yeah he might be 5ft 4 at most and giving himself a half inch for luck. Standing "about" 5'5" means he is LESS THAN 5'5" GUARANTEED. He's 5'4" and change. Carlos Correa is 6-2. He's the same height as 6-2 max Alex Rodriguez. Justin Verlander is 6-4 max. He was listed as that in college and I've met him. So, yeah, definitely 5'5" is tops. Editor Rob: yeah you can see another photo of him with Watts, certainly makes 5ft 6 impossible, even 5ft 4.5 is believable.